The Human Resources function has experienced a dramatic transformation over the past century. Along the way, roles and responsibilities have shifted as internal business models and external market conditions have changed. 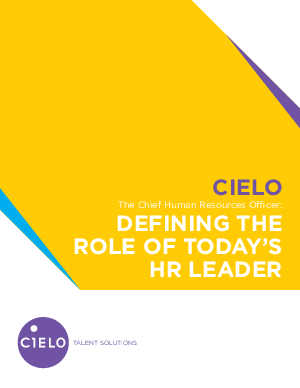 The evolution of the perception of HR, however, has not kept pace. Today’s Chief Human Resource Officers are breaking from traditional, process-oriented tacticians into strategic leaders that solves real business problems. Learn how to transform your approach to talent and focus on the bigger business with these seven key leadership traits.